It was only a days ride to Siem Reap, which was a tough, hot 160km through some awesome little villages, with so so many people saying hello, waving etc, which was very special, and something which was still a new and incredible thing to me, even though I’d experienced it everyday for the past 7 months. At one point in the day, the sun was ferocious and I felt like I was in a sauna, with my body radiating heat, so I stopped on the side of the road under a tree to cool down in its shade. I was soon ushered to sit on a bench by a group of local teenagers, who took turns, one after the other, in asking for and taking a “selfie” with me, before I asked for a group shot with them. It was cool. Group of teens on side of the road who 1 by 1, sat and had a ‘selfie’ with me. I stopped at a gas station where I had noticed a fridge, and sensing I was in need of a sit down, the woman owner pulled over a large, teak chair for me to sit on, which was very kind and very welcome. It was 7pm when I arrived into the outskirts of Siem Reap, and was surprised to see the road I was on, a boulevard of large hotels, with bright lights flashing, and Chinese people everywhere, which, as the gateway to one of the former 7-wonders of the world, I hadn’t expected. I soon passed through this area and arrive into the heart of Siem Reap. The following day I rode around the lively and intriguing Siem Reap, exploring this multi-faceted town. On one hand, you’ve got the gateway to one of the former 7-wonders of the world, the ancient Angkor Wat, and Cambodia’s most revered Temple. On the other hand, and all due in part to the first hand, you’ve got a tourist hot spot and a town very much equipped to cater to that, with the centre of the city filled with the ubiquitous ‘walking street’ and culturally indecorous ‘pub street’, tacky souvenir shops, over priced western food, with tourist flocking this area. Whilst the centre is a grid of bars and restaurants, amongst these streets you can find some truly authentic experiences. I made my way to one side alley local street food restaurant, and got laughed at when I sat down by the owner and the locals, with the owner shouting “Barang” to one of her staff, which is the Khmer word for the Thai word “ Farang”, meaning “foreigner”. I ordered fried rice and Laab salad, a spicy pork mince and herb salad and sat, watching person after person arrive and get their food before me, which I just found funny at first. “Barang” eats after everyone else eats! They seemed to find it funny as well, and I just laughed with them, until the funny side wore off and the discourtesy was evident. I gave a polite “jokes over” gesture, and they got the hint, with a small apology and the food soon arriving. The food at these little street stalls is always super fresh and delicious, with this particular Laab salad absolutely delicious, albeit with enough chilli to use it as a weapon for self defence. As I was a paying I started talking to a couple of local guys, who, after a few minutes of chatting, had pulled up another chair and asked me to sit. They were both enjoying quite a few beers it seemed and the conversation soon got onto politics. “ Our government is very bad. I love my country, but we have nothing, and the government very bad. We have election soon, but we already know who wins. Please help my country, please help my country” one of the guys was saying. I’d planned to go to Ankor Wat the following day, and having woken at 4.15am to catch the sunrise and made my way on Surly Temple, I got half way there and decided that I would turn around and go the following day instead. That, and for some moronic reason, I hadn’t bought a ticket. Doughnut! Arriving back into Siem Reap around 05.45 after an early morning 25km ride, I cycled the streets taking in the quietness of the town. I stumbled across an amazing little food stall serving a delicious smelling, dark stew. “What is it?” I asked, intrigued by this umami fragrance coming from the large stock pot. “Cow blood noodle soup, with chicken and cow bloody jelly. It is from Thailand and called Thai Boat Soup or KuayTiaw Reua” the English speaking, smartly dressed Khmer girl standing next to me responding. “ This is the best place to try it. Very fresh”. “Amazing” I replied, “Thank you”. “Muoy saum”, I said, pointing at the large stock pot. “One please”. What can I say, this was one of the most delicious things I’ve tasted. I watched excitedly as the chef pulled a large plastic bottle of bright red blood from a cooler and poured it into the large pan. Do breakfast get heartier than this? I’m not sure…. Thai Boat Soup or KuayTiaw Reua. You can see where the blood has congealed and separated from the stock. Mmmm grainy. It was still only 6.30am and I’d already done 20km, so feeling a bit peckish and with this new found delicious dish tasting so good, I ended up having 2 bowls of heartiness. I look forward to making this for people one day for sure! The next morning, I woke at 3.50am and was on the road by 4.10. After 15km, I arrived at a check point. “Ticket please” asked the policeman. “I need to buy one” I responded, thinking the ticket office was here. “You must go to ticket office, 15 minutes from here” he said, pointing. Sensing my disappointing, and seeing that I was already hot and sweaty from cycling here, he called over to an older policeman who was sat on a chair and uttered something. “He will take you to ticket office” the police man said, pointing at the old man. “Thank you so much” I replied, offering a Sampeah, the Cambodia greeting or way of showing respect, to which he returned. So, after riding on the back of the policeman’s old motorbike to the ticket office and back, I was on my way and arrived just in time for sunrise at Angkor Wat. Angkor Wat soon appeared in front of me, with the red sky forming all around as the sun rose in the sky. I continued slowly cycling along, taking in this unique moment, but not stopping to sit with the small crowds along the banks. I had wanted to experience as much of the park as I could and if I could do it alone, even better. So I made my way to Angkor Thom, the last and most enduring capital city of the Khmer empire, where I was greeted with silence. Angkor Archaeological Park, a vast land of temples spread across 400 square km, with new temples and ruins being re-discovered nearly every year, was only rediscovered in 1860, having been lost since the 15 century. Angkor Wat, the main attraction in the park, is considered to be the largest religious monument in the world and translates to "City of Temples" or simply "City Temple", and was constructed in the early 12th century between 1113 and 1150. Angkor Wat was built as a Hindu Temple, and at the time it was built and still today, Hindu temples generally face east, but Ankgor Wat was unusually oriented to the west, a direction typically associated with death in Hindu culture. Archaeologists and scholars disagree as to why the ancient builders chose to deviate from the norm, adding to its wonder. In addition, Angkor Wat was dedicated to Vishnu, a Hindu deity, rather than the king, which was also unusual for that time. Angkor Wat then shifted from Hindu to Buddhist use sometime around the late 13th century, highlighting the just how closely linked Hinduism and Buddhism are. Actually, Siddhartha Gautama, known now as Buddha, was believed to have been a wealthy Indian prince who started out as a Hindu, but founded Buddhism, substantiate theories that Buddhism is a subset of Hinduism. I digress. One thing I did learn before visiting Angkor Wat, was that many surfaces of the Angkor temples were once painted, which, once aware of this, offers a different perspective. Today, only very small traces of the paint remains on just a few temples. Within the Park, which has no defined boundaries, are small villages and settlements, and local people also use the roads surrounding Angkor Wat and the rest of the park as local roads leading to Siem Reap. I didn’t plan my day except for visiting one particular temple, 20km past Angkor Wat, instead, choosing to ride Surly Temple 70km around the park and stopping when I stumbled across something. Phnom Bok, a relatively unknown temple to the masses, is set up high on one of the three hills in the plains of Angkor, with 650 steps leading up to the top. For no particular reason, I had it in my mind that I wanted to visit Phnom Bok, and I’m glad I did, as after climbing the 650 steps, I was left to feel this quiet temple and view on my own, in silence. Admiring natures course at Phnom Bok, Angkor. Built by King Yasovarman I (1st) around 910 CE, Phnom Bok, known for the triple shrine dedicated to the Trimurti (three forms, “Brahma-Vishnu-Maheshwara.”), is one of the most ancient sites in Angkor and is one of the three mountain temples built on the three hills of the plains of Angkor . A temple at the top of Phnom Bok. Phnom Bok, built in 910 CE, was chosen as a highly religious site. Nature never rushes, it just is. We can learn lots from it. I visited Angkor Wat towards the end of the day and, in a rare moment of aloneness found at an elevated position at the rear of Angkor Wat, I sat on the stone wall, with carvings all around and small signs of the paint that once coated the walls. All of a sudden an eerie silence, calm and presence fell upon me as if to say “this is a little bit of something special, just for you. You are welcome to enjoy it”. I stood looking out of the back of Angkor Wat, contemplating this once prosperous Kingdom and the many footsteps that have touched these surfaces once before me, not quite feeling alone. It was special. As I’m stood there, a young Cambodian man appears up the steps in front me and says “do you know the ancient King used to stand in that exact spot looking out over this land and used to sit there” pointing at the very spot I’d just been sat in. With this, a huge grin crept over my face. “Nice” I thought to myself, giving a little bow to the presence that allowed me that moment. ﻿Ankor Wat is a very special place for the Cambodians who are incredibly proud of it, so much so, that it features on their national flag, 1 of only 5 countries to put a famous national construction on their national flag. The others including Afghanistan, San Marino, Spain and Portugal. For me, the experience was some ‘Wat’ underwhelming and I’m not 100% sure why. I think it might be something to do with just the sheer volume of people that also experience it everyday, which, for me takes away the unique authenticity of it. I also feel that there’s so much commerciality behind Angkor Wat now, that any authenticity that did remaining, has been lost for gain. With this in mind, you might be surprised to know that since 1990 until recently, Angkor Wat was owned by a private Vietnamese company founded by an ethnic Vietnamese-Cambodian businessman, who has managed the tourism of Angkor Wat since 1990. Although it claims that most of the ticket sales goes to maintaining the temples in Siem Reap, many many Cambodians assume that Cambodia is not receiving any of the profits. It’s almost as if the history of this once incredible and prosperous land has been washed away and tainted by the many modern footsteps and desires that are so out of touch with what is real, that it is hard to really see it for what it once was. I’ve explored less visited temples and wats where I’ve experienced something incredible and where I’ve felt in touch with its past and soul, but, apart from my moment with the ancient King on his steps, I felt that Angkor Wat had lost its soul to the modern world, much like the modern world. For me, the likes of Angkor Wat should remain for the people of Cambodia, or at the very least, have the numbers controlled, much like Son Doong Cave, the largest cave in the world. With all that said, Angkor Wat was still an incredible experience and I feel privileged to have been able to see it. After 2 months in Cambodia, the next leg of the journey was about to start, with me crossing my fourth land border crossing in Thailand. I left Siem Reap a bit later than had intended, with Sisophon, 110km away, my goal. 5km from Sisophon and with no buildings in sight, I got caught in the worst storm I’d been in yet. It rained so hard I could barely see in front of me. I saw a bolt of lightning hit the ground, accompanied by an instant crack of thunder that felt like it had cracked the sky in half. “Holy Shieet” I thought, “any closer and I’m cooked” half joking, half aware that this was now pretty dangerous. I just carried on pedalling with the rain thrashing it down. 2km from my guesthouse and I spot a heaving, open sided restaurant on the side of the road on the edge of town and make a b-line for it. As soon as people saw me, they stood and waved me in quickly, laughing and smiling at the sight of this drenched ‘Barang’ cycling through a monsoon and now stopping in their local restaurant. My last day riding through Cambodia was a typical border approach, where things always get a little bit gnarly. This crossing being up there with the gnarliest, with the typical stares from people but without the typical smiles and waves. It’s these towns that take on an identity of their own. A hectic blend of commercial trading, cultures and something a little bit darker. 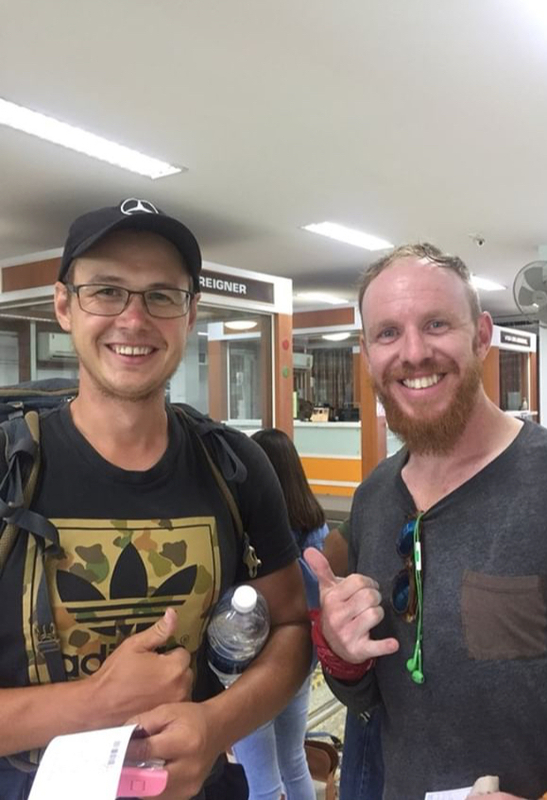 I met a nice Russian couple as I queued at the passport desk who were hitchhiking their way around Southeast Asia and back to Russia, without any other form of transport which I thought was great. Andrey from Russia hitchhiking his way around Southeast Asia and back to Russia with his girlfriend. Thanks for reading. Hope you are all well and happy.